Combine first three ingredients coating and seasoning all asparagus spears evenly. Under high heat, broil asparagus spears, leaving them crisp. Remove from broiler. Season with truffle oil, fleur de sel and Parmigiano-Reggiano (in that order). 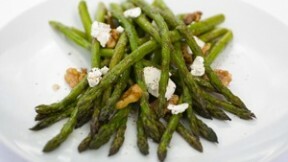 Serve immediately or add cheese at the table, in that the cheese should not melt over the hot asparagus.